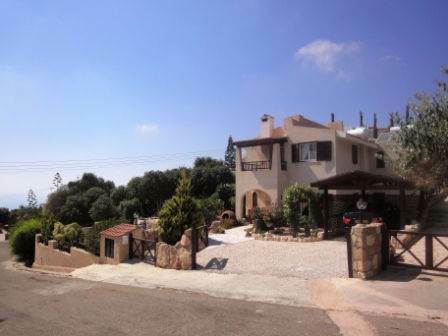 Cyprus Property Blog by Cleo : Kamares Villa in Paphos - Price Reduced & Fully Furnished! Kamares, Paphos - Originally designed for the President of Lebanon, this luxury 5 bedroom villa was later converted into 2 separate dwellings by 2 brothers. Later, when the current owners bought the home, extensive refurbishment was carried out, and the house once again became one residence. Due to it’s history, the house has some unusual features giving the property real character. The property is situated in a quiet cul-de-sac in the hills of Kamares, a popular residential area which has it’s own Clubhouse and Medical Centre. Paphos Town and the International School of Paphos are a short drive away. The ground floor features a huge living room with a feature open fireplace, and archway through to the dining room and kitchen. Patio doors lead to an outdoor terrace beautifully covered with greenery, and arranged into an outdoor dining space and comfortable seating area. Accessed from both the lounge and kitchen is a hallway off which is a large double bedroom with en-suite bathroom and patio doors to the garden terrace, a guest cloakroom, utility room and large storage cupboard. A beautiful wooden staircase winds up to the first floor hallway, which still has the separate entrance from when it was divided into two properties. Here there are a further 4 bedrooms, 2 bathrooms and 1 shower room, a walk-in closet and dressing room. The master bedroom is full of character with wooden beamed ceilings and feature stone fireplace. On the far wall, patio doors open onto a large covered balcony with sea & mountain views, and at the side, patio doors provide easy access to a covered terrace and private garden with mature fruit orchard. A second balcony, accessed from bedroom 2 & 3 also has great views. The gardens are beautifully landscaped and include a waterfall feature which recently won a local award. At the front of the property is the private pool area which is carved into the hillside and takes advantage of the lovely views.